In Part 1 we met Martin and Victoria, the couple from Aberdeen that had the perfect vision for a sparkling elegant Beach Club Wedding in Marbella. Find out how their spectacular wedding day went and how Martin’s big surprise made his new wife cry with happiness. Victoria looked radiant as she walked down the aisle in her lace edged fitted dress adorned with hundreds of tiny glass crystals. Local singer Zoe sang a beautiful rendition of ‘A thousand Years’ and after the ceremony the couple exited to her singing ‘Signed Sealed Delivered’. Guests were further wowed when two huge confetti canons were fired, showering the couple and their friends and families with multicoloured confetti. As you can see in the photos everyone was grinning from ear to ear, it was the perfect start to a party to remember. As day turned to night the Marbella Beach Club came into its own with the incredible lighting we had organized, with long pillars of light giving the venue a magical glow. There was also a huge LOVE sign reflecting in the pool’s surface and the dinner tables were laid out beneath twinkling fairy lights. 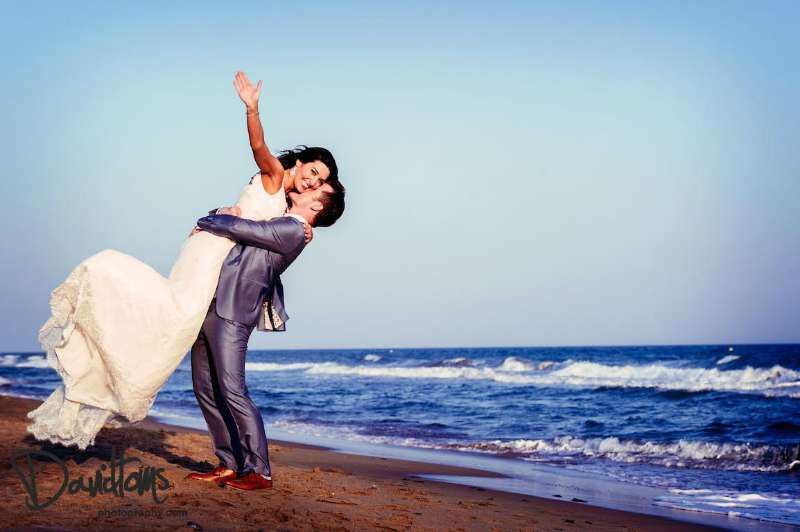 Whilst guests enjoyed pre-dinner drinks by the pool, photographer David Toms took some beautiful romantic shots of Victoria and Martin on the beach beside the venue. Then, once the guests had finished their evening meal, the groom had a surprise for his new bride. The year before the couple had been at a wedding in the UK where they enjoyed the music by well known singer Cole Paige. Victoria had asked him whether he would be available to sing at their wedding and he had told them that he would be busy at a gig in Las Vegas. Little did she know that in fact her future husband had already booked Cole to surprise her on the day…and when the singer stepped out and began to sing her face was a picture and she knew she had married the man of her dreams. Later that evening both local singer Zoe and Cole performed together on stage. The wonderful day turned into a wonderful night when guests moved inside to dance to the DJ, and lots of fun was had with props and silly hats in the photo booth. It’s fair to say that Martin and Victoria certainly got their dream beach club wedding in Marbella. There was sunshine, shimmering sea, surprises and of course lots of and lots of sparkle.